I got the itch real bad. Now that I am supposed to be a professional, and by that I mean I have a full time job, I do not have as much opportunity to get out and explore anymore. Don't get me wrong I love my life, but I'm missing my good friend mother nature right now. Luckily I have set aside a date to get out and hone my cold weather (hopefully winter like) camping skills. 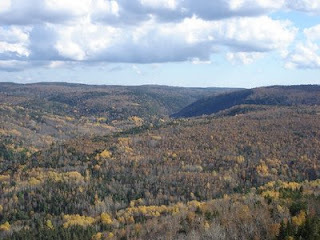 I will be heading into Hidden Valley and the Parlee Brook watershed to explore nature and myself. I hope to find something I have never found in there before. I have spent a great deal of time in the area in summer and fall, but this will be my first foray into the Valley overnight in winter time. Cold weather camping is difficult, especially in March, due to the temperature fluctuations. You never want to be sweating, but you don't want to be shivering either so packing the right clothes and knowing when to wear what is important. I can't give you any advice here really because it is different for everyone. I go with what works for me which is likely the reason why all my winter camping clothes are worn and tattered. I can't part with what works so I wear it till it falls off me. I have a good friend of mine joining me for this hike and it was he who suggested we head into Hidden Valley (or Arnold's Hollow). I had led him in there once before in the fall and he loved it. We may take some ice climbing gear and try our hand at that, although I am very much a novice when it comes to climbing on anything let alone ice. I have looked over my topo maps, even though I have that area pretty much memorized, just to look at where I have been and where I can go. I am going to try a hike around the Valley's south east ridge as I am confident there are some rock faces and ravines in there that I haven't yet explored. Being winter I likely will only find hardships and snow, but the scenery from that side of the hill will likely be amazing too as I will be able to look up the Parlee Brook and Purtill Brook valleys to the Trout Creek Watershed divide. I now on the north side of Parlee Brook the ravines are steep and full of some great bouldering locations so I bet I find more of the same here on the south side. I'm hooked on the Hidden Valley. So much territory to explore in there and yet each time I go the conditions are so different. This past Saturday I found the hardened cones of multiple old avalanches in the gully behind the cabin. We must have been walking on more than 12 feet of snow as we climbed up the narrow pass in the gully. I agree, keep those photographs for yourself and just put up the teasers.